The Gospel of Judas Copyright by Norman L. Geisler 2006. 5 II. When Was It Discovered? A. A. D. 180 Ireanaeus referred to it. B. 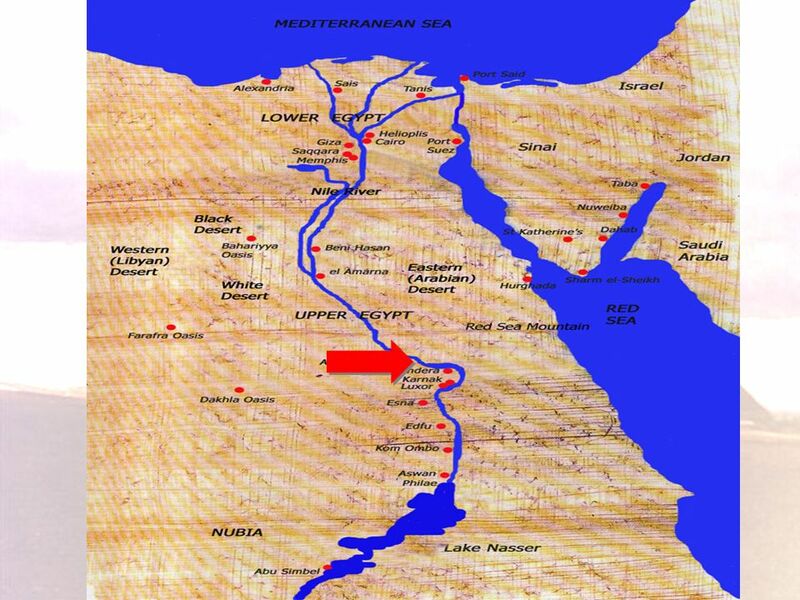 In 1978 discovered by a treasure seeker in a stone box in a cave by the Nile in Egypt. C. 1980 it was sold to an antiquity dealer in Egypt. D. 1983 it was recovered after being stolen from an antiquity dealer. E. It was authenticated by Princeton scholar (but not purchased) and put in a NY bank for 16 years. 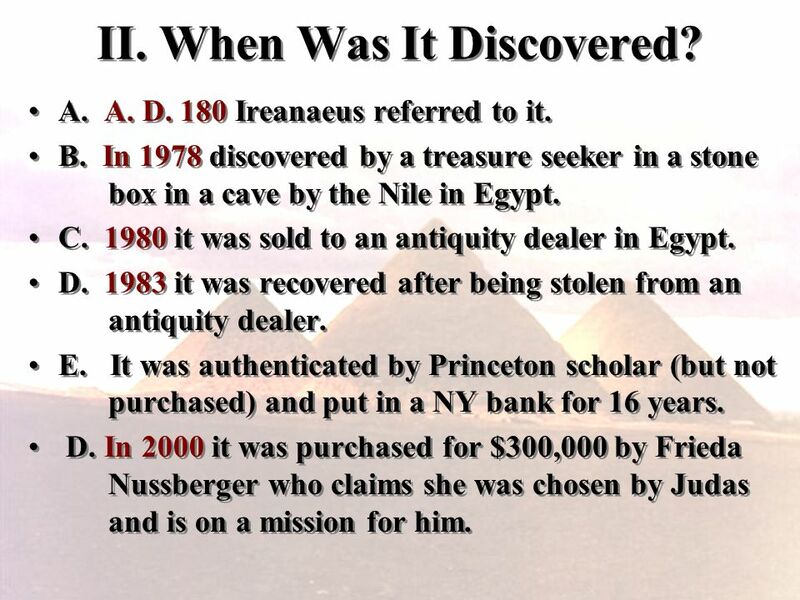 D. In 2000 it was purchased for $300,000 by Frieda Nussberger who claims she was chosen by Judas and is on a mission for him. A. A. D. 180 Ireanaeus referred to it. B. 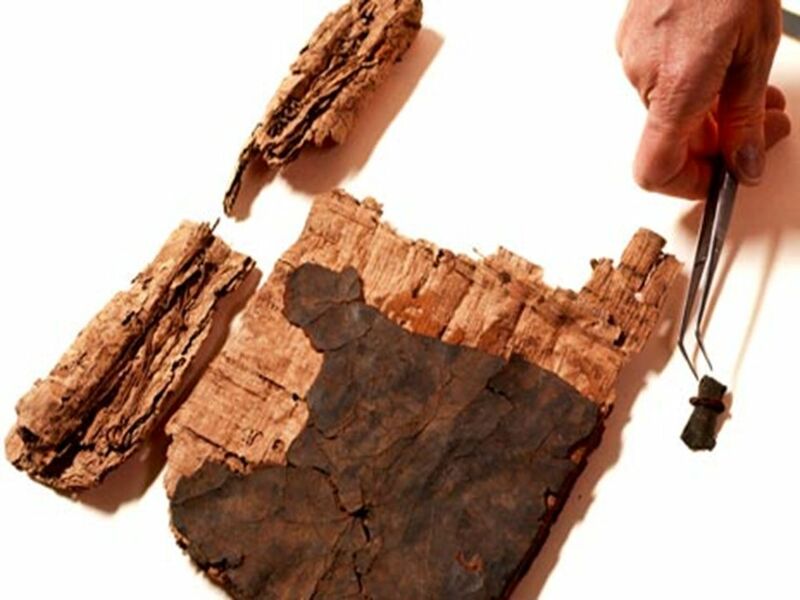 In 1978 discovered by a treasure seeker in a stone box in a cave by the Nile in Egypt. C. 1980 it was sold to an antiquity dealer in Egypt. D. 1983 it was recovered after being stolen from an antiquity dealer. E. It was authenticated by Princeton scholar (but not purchased) and put in a NY bank for 16 years. D. In 2000 it was purchased for $300,000 by Frieda Nussberger who claims she was chosen by Judas and is on a mission for him. 6 III. What Does It Teach? 1. Judas alone understood the truth about Jesus (had special wisdom) 2. Judas did not want to betray Christ 3. Jesus said Judas would be greater than the other disciples--a great star ruling over them. 4. The Serpent in Eden was a good being. 5. Body is a prison from which death releases us. 6. Jesus death was a good thing. 7. Jesus sometimes appears as a child in it. 8. Jesus laughed at disciples when they were giving thanks to God. 9. Creator God was not worthy of worship. 1. 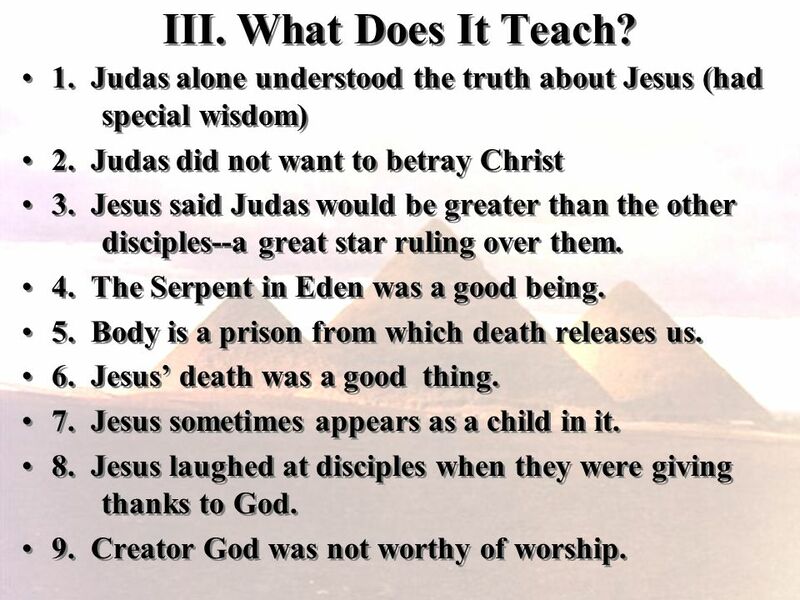 Judas alone understood the truth about Jesus (had special wisdom) 2. Judas did not want to betray Christ 3. Jesus said Judas would be greater than the other disciples--a great star ruling over them. 4. The Serpent in Eden was a good being. 5. Body is a prison from which death releases us. 6. Jesus death was a good thing. 7. Jesus sometimes appears as a child in it. 8. Jesus laughed at disciples when they were giving thanks to God. 9. Creator God was not worthy of worship. 7 III. What Does It Teach? (Continued) 10. Jesus laughed at the disciples for giving thanks to God in prayer. 11. The disciples blasphemed Jesus in their hearts because he laughed at them. 12. A perfect human dwells within all of us. 13. All men have a god within them. 14. Only Judas recognized this truth, not the other disciples. 15. No crucifixion or resurrection is mentioned. 16. The betrayal of Jesus was a good thing. 17. The proper method of interpretation is allegorical (which reaches the deeper truths). 18. Christ is merely the angel called Seth who rules over the chaos, not the great invisible [Spirit]. 10. Jesus laughed at the disciples for giving thanks to God in prayer. 11. The disciples blasphemed Jesus in their hearts because he laughed at them. 12. A perfect human dwells within all of us. 13. All men have a god within them. 14. Only Judas recognized this truth, not the other disciples. 15. No crucifixion or resurrection is mentioned. 16. The betrayal of Jesus was a good thing. 17. The proper method of interpretation is allegorical (which reaches the deeper truths). 18. Christ is merely the angel called Seth who rules over the chaos, not the great invisible [Spirit]. 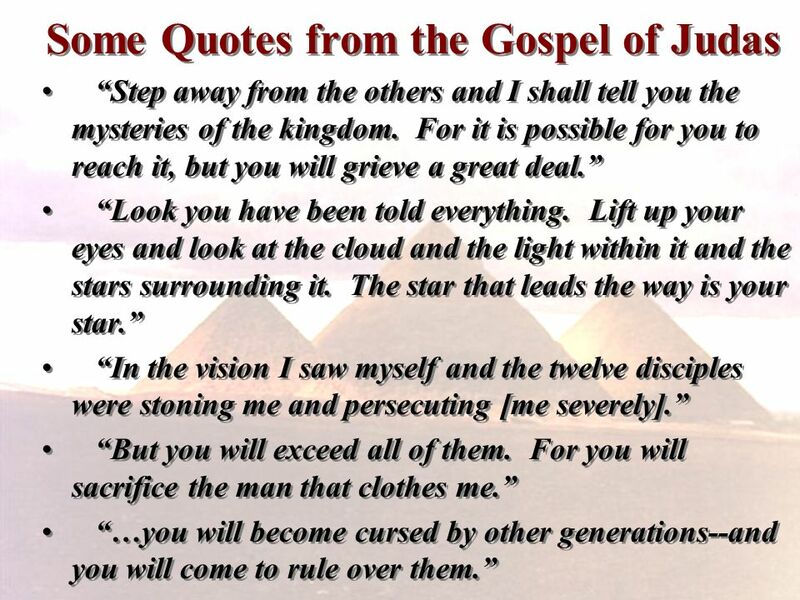 8 Some Quotes from the Gospel of Judas Step away from the others and I shall tell you the mysteries of the kingdom. For it is possible for you to reach it, but you will grieve a great deal. Look you have been told everything. Lift up your eyes and look at the cloud and the light within it and the stars surrounding it. The star that leads the way is your star. In the vision I saw myself and the twelve disciples were stoning me and persecuting [me severely]. But you will exceed all of them. For you will sacrifice the man that clothes me. …you will become cursed by other generations--and you will come to rule over them. Step away from the others and I shall tell you the mysteries of the kingdom. For it is possible for you to reach it, but you will grieve a great deal. Look you have been told everything. Lift up your eyes and look at the cloud and the light within it and the stars surrounding it. The star that leads the way is your star. In the vision I saw myself and the twelve disciples were stoning me and persecuting [me severely]. But you will exceed all of them. For you will sacrifice the man that clothes me. …you will become cursed by other generations--and you will come to rule over them. 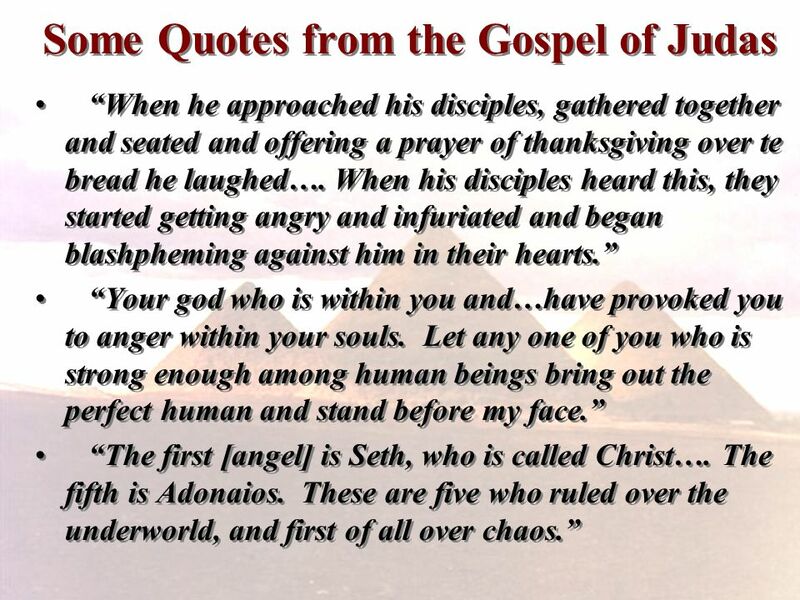 9 Some Quotes from the Gospel of Judas When he approached his disciples, gathered together and seated and offering a prayer of thanksgiving over te bread he laughed…. When his disciples heard this, they started getting angry and infuriated and began blashpheming against him in their hearts. Your god who is within you and…have provoked you to anger within your souls. Let any one of you who is strong enough among human beings bring out the perfect human and stand before my face. The first [angel] is Seth, who is called Christ…. The fifth is Adonaios. These are five who ruled over the underworld, and first of all over chaos. When he approached his disciples, gathered together and seated and offering a prayer of thanksgiving over te bread he laughed…. When his disciples heard this, they started getting angry and infuriated and began blashpheming against him in their hearts. Your god who is within you and…have provoked you to anger within your souls. Let any one of you who is strong enough among human beings bring out the perfect human and stand before my face. The first [angel] is Seth, who is called Christ…. The fifth is Adonaios. These are five who ruled over the underworld, and first of all over chaos. 10 IV. What Some Say About It. 1. It is authentic. 2. Judas was not a villain but a hero. 3. Orthodox Christianity has vilified Judas. 4. Even in the NT there is growing vilification from Mark to Matthew to John. 5. Along with the (public) Gospels, The Gospel of Judas cam be used for private insight. 6. There was diversity in early Christianity. 7. It turns the Gospel story of Judas on its head. 1. It is authentic. 2. Judas was not a villain but a hero. 3. Orthodox Christianity has vilified Judas. 4. Even in the NT there is growing vilification from Mark to Matthew to John. 5. Along with the (public) Gospels, The Gospel of Judas cam be used for private insight. 6. There was diversity in early Christianity. 7. It turns the Gospel story of Judas on its head. 11 V. What They Say About Christianity? 1. There was no Bible in A.D. 100. 2. It took hundreds of years for Christians todecide the number of books in the NT. 3. There were some 30 other Gospels. 4. NT Gospels were anonymous. 5. Mark was written by A.D. 60. Matthew was written by A. D. 70-72. 6. The rest of NT was completed by A. D. 100. 7. Acts contradicts Gospels on Judas death. 8. Christians demonized Judas to distance themselves from the Roman persecution of Jews. 1. There was no Bible in A.D. 100. 2. It took hundreds of years for Christians todecide the number of books in the NT. 3. There were some 30 other Gospels. 4. NT Gospels were anonymous. 5. Mark was written by A.D. 60. Matthew was written by A. D. 70-72. 6. 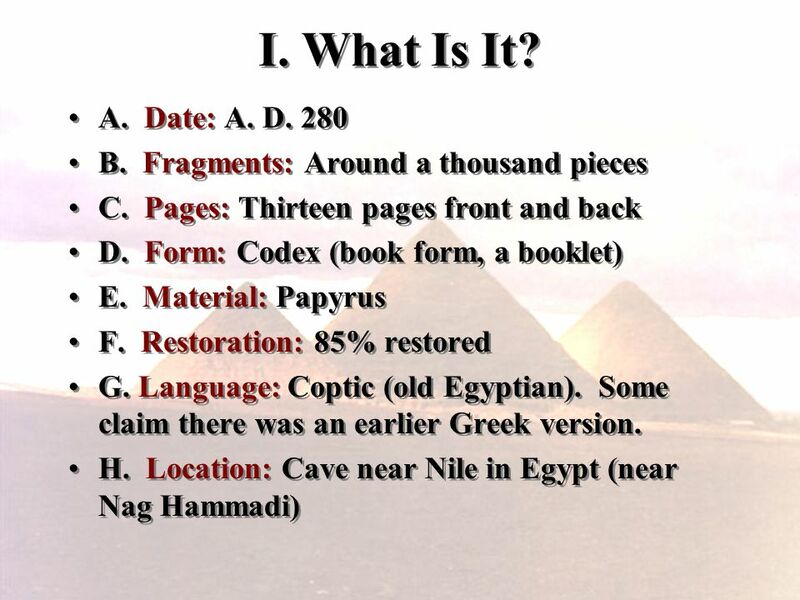 The rest of NT was completed by A. D. 100. 7. Acts contradicts Gospels on Judas death. 8. 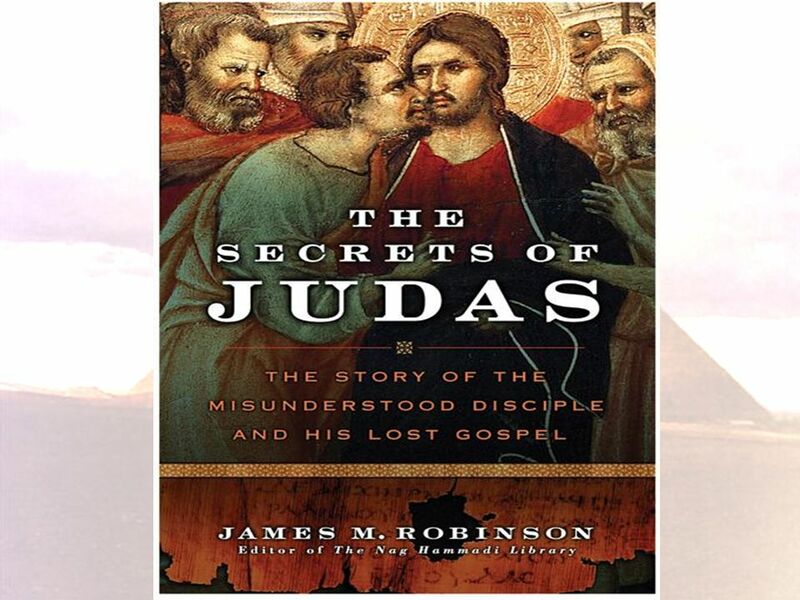 Christians demonized Judas to distance themselves from the Roman persecution of Jews. 12 VI. 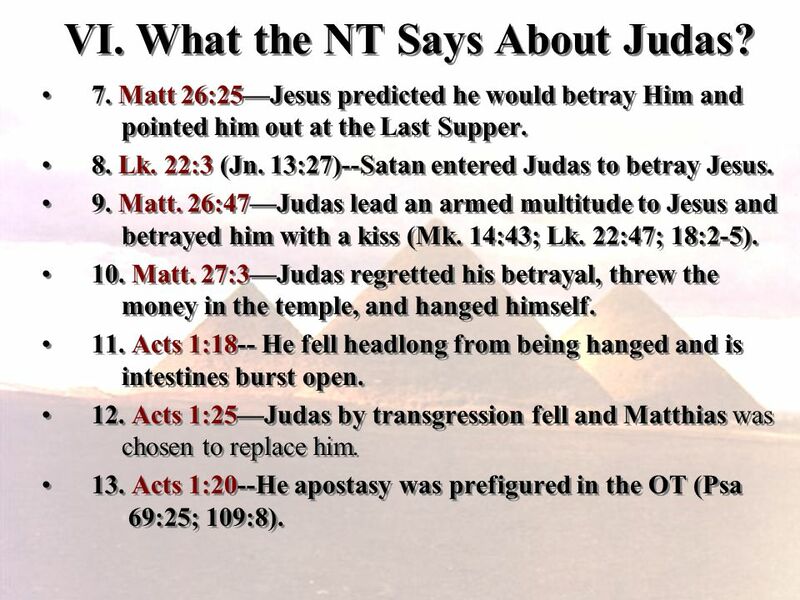 What the NT Says About Judas? –(There are 19 references; 17 by name, all but Jn. 6:71; 17:12) 1 Matt. 10:4 (Mk 3:19; Lk. 6:16)Jesus chose Judas as an apostle. 2. Jn. 6:71Jesus predicted one of twelve would betray him. 3. Jn. 12:4-6Judas complained about the waste of costly oil Mary used on Jesus. John noted that Judas stole money from Jesus treasury which Judas was in charge of keeping (Jn. 13:29). 4. Jn. 13:2Satan put in Judas heart to betray Christ 5. Jn. 17:12Jesus called him the son of perdition (hell). 6. Matt. 26:14 (Mk. 14:10)He sought to betray Jesus and made deal with chief priests for 30 pieces of silver. –(There are 19 references; 17 by name, all but Jn. 6:71; 17:12) 1 Matt. 10:4 (Mk 3:19; Lk. 6:16)Jesus chose Judas as an apostle. 2. Jn. 6:71Jesus predicted one of twelve would betray him. 3. Jn. 12:4-6Judas complained about the waste of costly oil Mary used on Jesus. John noted that Judas stole money from Jesus treasury which Judas was in charge of keeping (Jn. 13:29). 4. Jn. 13:2Satan put in Judas heart to betray Christ 5. Jn. 17:12Jesus called him the son of perdition (hell). 6. Matt. 26:14 (Mk. 14:10)He sought to betray Jesus and made deal with chief priests for 30 pieces of silver. 13 VI. 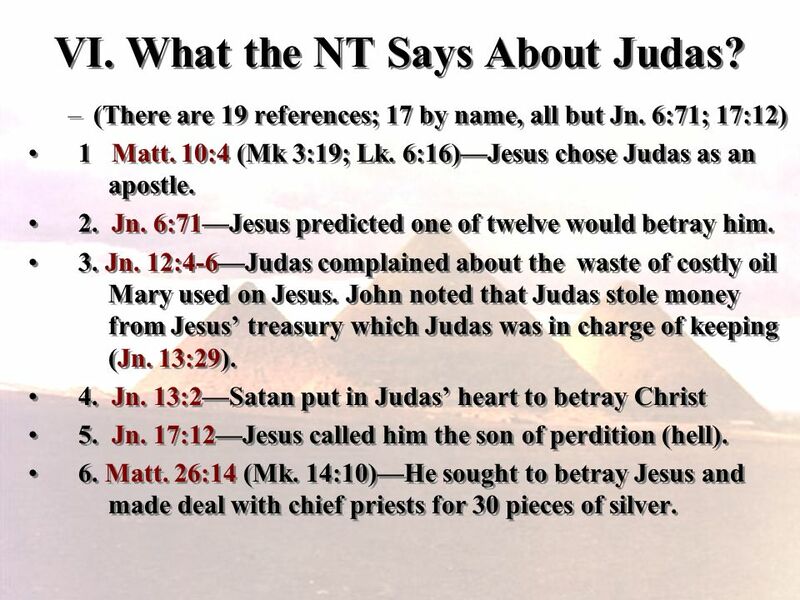 What the NT Says About Judas? 7. Matt 26:25Jesus predicted he would betray Him and pointed him out at the Last Supper. 8. Lk. 22:3 (Jn. 13:27)--Satan entered Judas to betray Jesus. 9. Matt. 26:47Judas lead an armed multitude to Jesus and betrayed him with a kiss (Mk. 14:43; Lk. 22:47; 18:2-5). 10. Matt. 27:3Judas regretted his betrayal, threw the money in the temple, and hanged himself. 11. Acts 1:18-- He fell headlong from being hanged and is intestines burst open. 12. Acts 1:25Judas by transgression fell and Matthias was chosen to replace him. 13. Acts 1:20--He apostasy was prefigured in the OT (Psa 69:25; 109:8). 7. Matt 26:25Jesus predicted he would betray Him and pointed him out at the Last Supper. 8. Lk. 22:3 (Jn. 13:27)--Satan entered Judas to betray Jesus. 9. Matt. 26:47Judas lead an armed multitude to Jesus and betrayed him with a kiss (Mk. 14:43; Lk. 22:47; 18:2-5). 10. Matt. 27:3Judas regretted his betrayal, threw the money in the temple, and hanged himself. 11. Acts 1:18-- He fell headlong from being hanged and is intestines burst open. 12. Acts 1:25Judas by transgression fell and Matthias was chosen to replace him. 13. Acts 1:20--He apostasy was prefigured in the OT (Psa 69:25; 109:8). 14 VII. 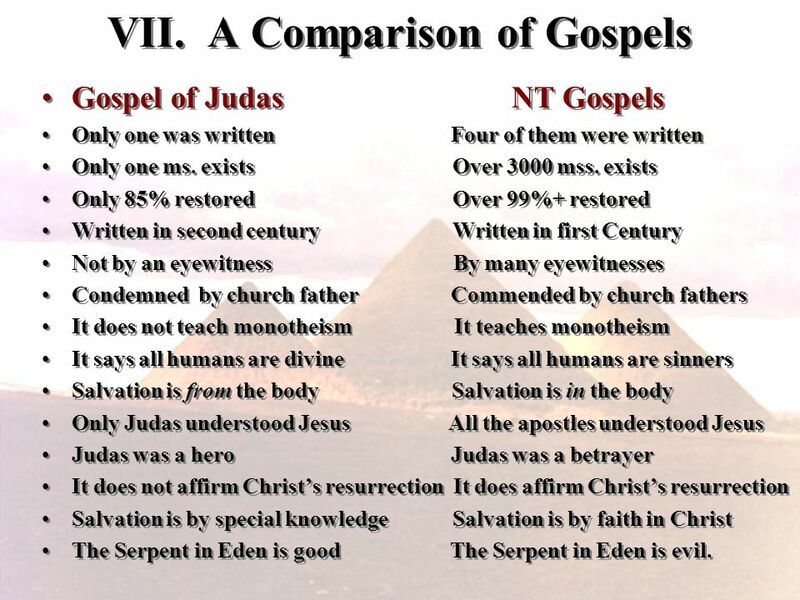 A Comparison of Gospels Gospel of Judas NT Gospels Only one was written Four of them were written Only one ms. exists Over 3000 mss. exists Only 85% restored Over 99%+ restored Written in second century Written in first Century Not by an eyewitness By many eyewitnesses Condemned by church father Commended by church fathers It does not teach monotheism It teaches monotheism It says all humans are divine It says all humans are sinners Salvation is from the body Salvation is in the body Only Judas understood Jesus All the apostles understood Jesus Judas was a hero Judas was a betrayer It does not affirm Christs resurrection It does affirm Christs resurrection Salvation is by special knowledge Salvation is by faith in Christ The Serpent in Eden is good The Serpent in Eden is evil. Gospel of Judas NT Gospels Only one was written Four of them were written Only one ms. exists Over 3000 mss. exists Only 85% restored Over 99%+ restored Written in second century Written in first Century Not by an eyewitness By many eyewitnesses Condemned by church father Commended by church fathers It does not teach monotheism It teaches monotheism It says all humans are divine It says all humans are sinners Salvation is from the body Salvation is in the body Only Judas understood Jesus All the apostles understood Jesus Judas was a hero Judas was a betrayer It does not affirm Christs resurrection It does affirm Christs resurrection Salvation is by special knowledge Salvation is by faith in Christ The Serpent in Eden is good The Serpent in Eden is evil. 15 VIII. 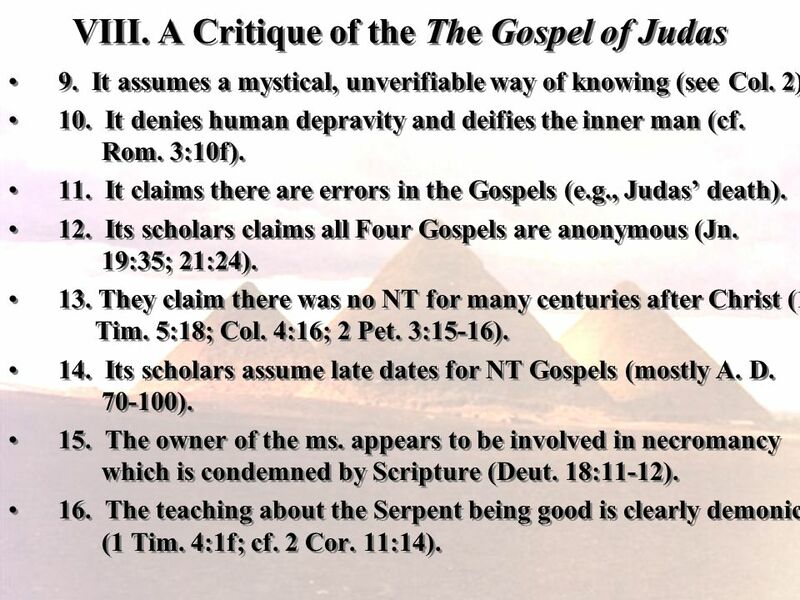 A Critique of the The Gospel of Judas 1. It could not have been written by Judas or an eyewitness since they were long dead. 2. The claims of the book has no confirmation from other sources (It is the sole copy). 3. It teaches heretical Gnostic doctrines (contrary to the NT and the early Christian Creeds). 4. Its portrayal of Judas as a hero and superior apostle is clearly contrary to the multiple, eyewitness, NT accounts. 5. It is contrary to epistles of Paul from A.D. 55-56. 6. It is not a gospel (good news) without the death and resurrection of Christ for our sins. 7. It has an unbiblical view of the body as evil (cf. Gen. 1:27; 1Tim. 4:4; Rom. 14:14). 8. It claims salvation is by special mystical knowledge, not by grace through faith (Eph. 2:8-9). 1. It could not have been written by Judas or an eyewitness since they were long dead. 2. The claims of the book has no confirmation from other sources (It is the sole copy). 3. 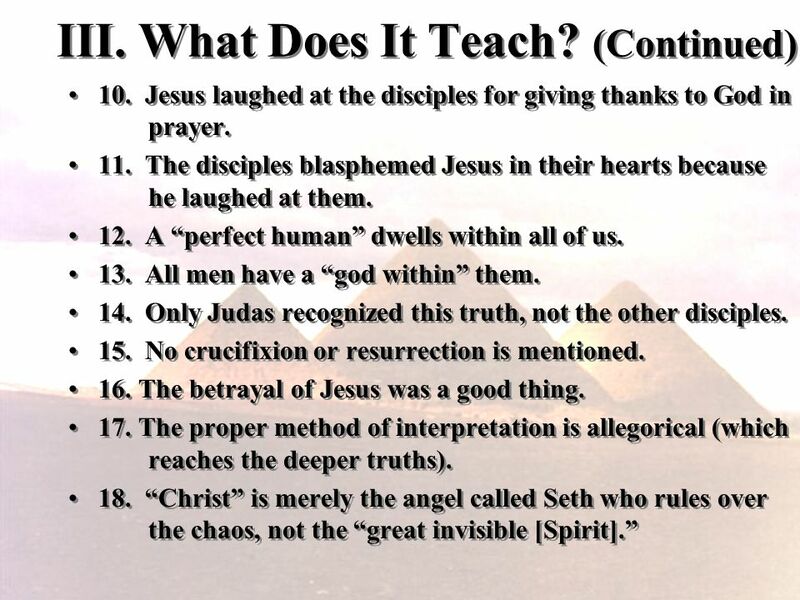 It teaches heretical Gnostic doctrines (contrary to the NT and the early Christian Creeds). 4. Its portrayal of Judas as a hero and superior apostle is clearly contrary to the multiple, eyewitness, NT accounts. 5. It is contrary to epistles of Paul from A.D. 55-56. 6. It is not a gospel (good news) without the death and resurrection of Christ for our sins. 7. It has an unbiblical view of the body as evil (cf. Gen. 1:27; 1Tim. 4:4; Rom. 14:14). 8. It claims salvation is by special mystical knowledge, not by grace through faith (Eph. 2:8-9). 16 VIII. 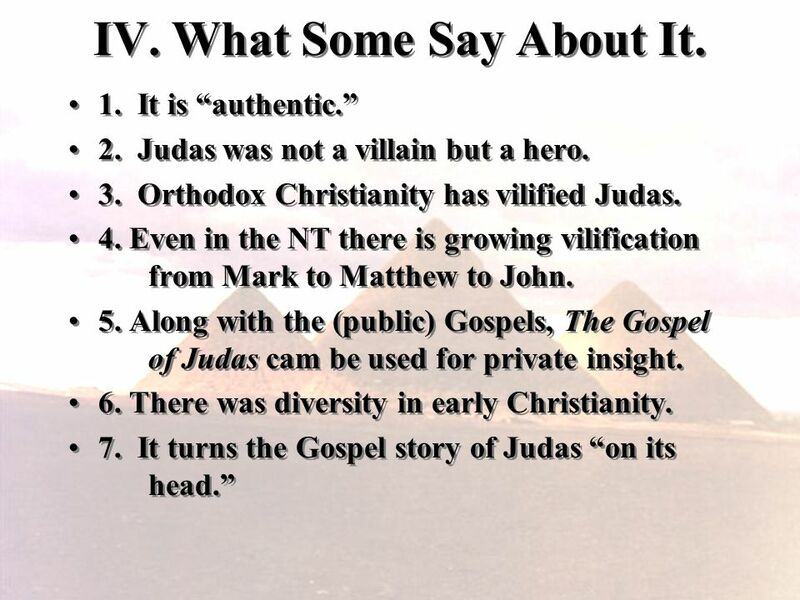 A Critique of the The Gospel of Judas 9. It assumes a mystical, unverifiable way of knowing (see Col. 2). 10. It denies human depravity and deifies the inner man (cf. Rom. 3:10f). 11. 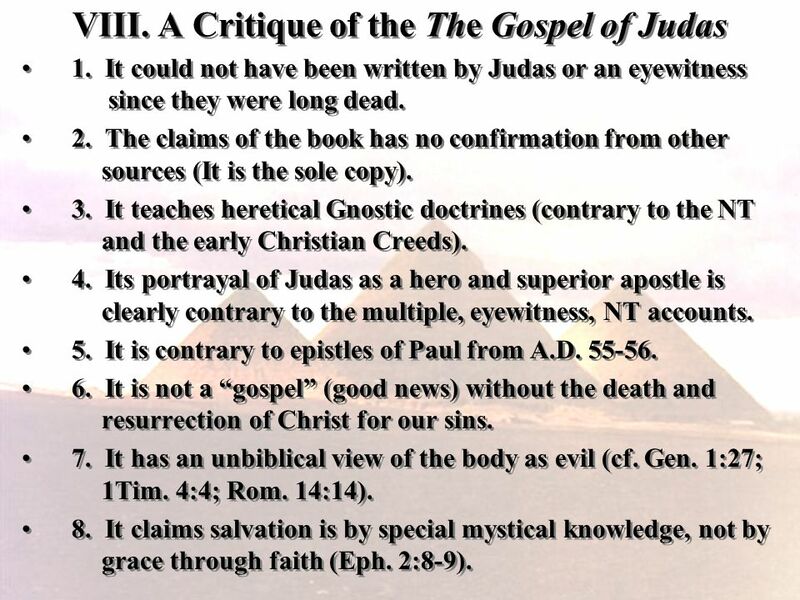 It claims there are errors in the Gospels (e.g., Judas death). 12. Its scholars claims all Four Gospels are anonymous (Jn. 19:35; 21:24). 13. They claim there was no NT for many centuries after Christ (1 Tim. 5:18; Col. 4:16; 2 Pet. 3:15-16). 14. Its scholars assume late dates for NT Gospels (mostly A. D. 70-100). 15. The owner of the ms. appears to be involved in necromancy which is condemned by Scripture (Deut. 18:11-12). 16. The teaching about the Serpent being good is clearly demonic (1 Tim. 4:1f; cf. 2 Cor. 11:14). 9. It assumes a mystical, unverifiable way of knowing (see Col. 2). 10. It denies human depravity and deifies the inner man (cf. Rom. 3:10f). 11. It claims there are errors in the Gospels (e.g., Judas death). 12. Its scholars claims all Four Gospels are anonymous (Jn. 19:35; 21:24). 13. 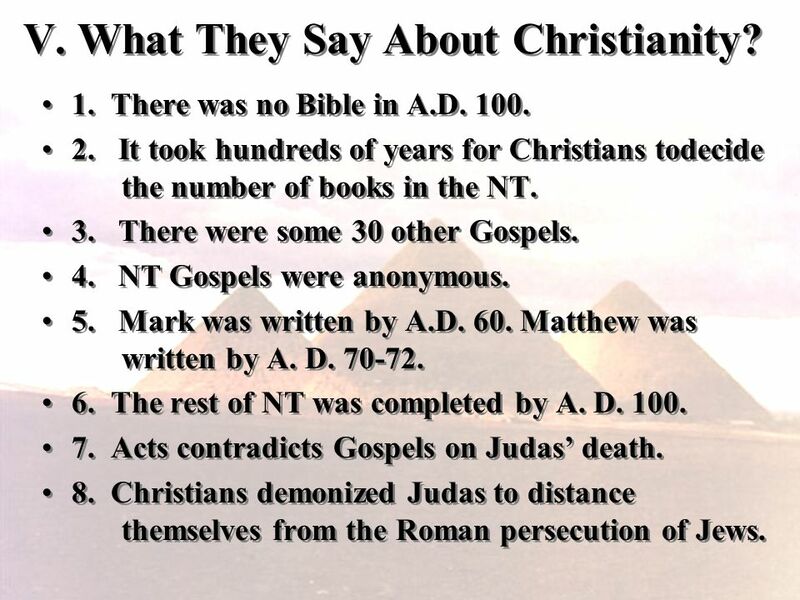 They claim there was no NT for many centuries after Christ (1 Tim. 5:18; Col. 4:16; 2 Pet. 3:15-16). 14. Its scholars assume late dates for NT Gospels (mostly A. D. 70-100). 15. The owner of the ms. appears to be involved in necromancy which is condemned by Scripture (Deut. 18:11-12). 16. The teaching about the Serpent being good is clearly demonic (1 Tim. 4:1f; cf. 2 Cor. 11:14). 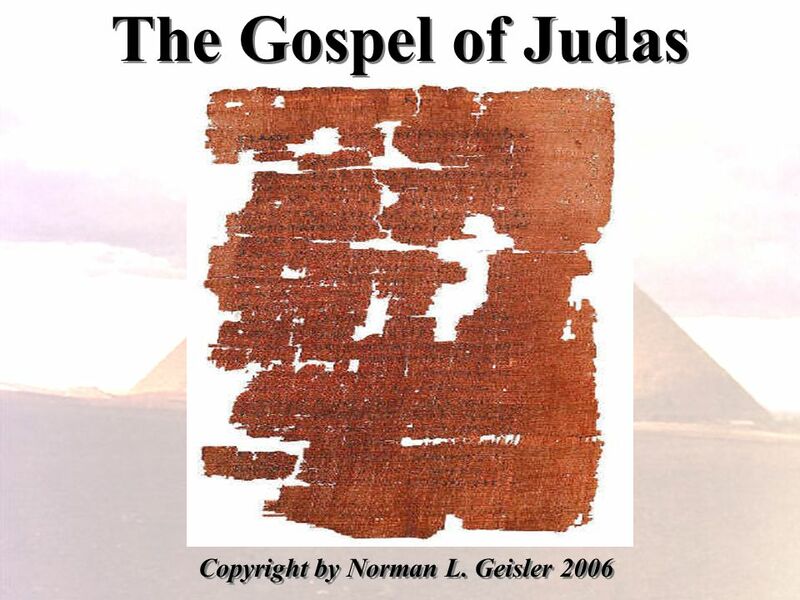 Download ppt "The Gospel of Judas Copyright by Norman L. Geisler 2006." The Church and The Kingdom Brian Aiken. The Church and The Kingdom Premillenialism – It is held that the OT prophets predicted the re- establishment of. Death Is Life Series: The Upside Down Way of Jesus. I. Conjunction. On condition that; in case that; granting or supposing that… (New Century Dictionary of the English Language, Vol. I, p. 790). One of. Do the Books of Matthew, Mark, Luke, and John Belong in the Old or New Testament? Title Slide: Do the Books of Matthew, Mark, Luke, and John Belong in.